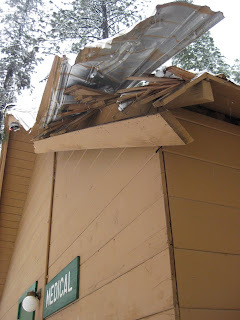 Camp Wawona News: Property Damaged as Snowstorm Continues. Property Damaged as Snowstorm Continues. 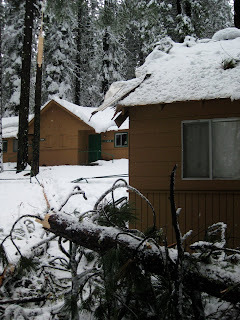 Snow continues to fall on Camp Wawona and the trees just can't take it anymore. Weighed down with the heavy, wet snow, branches, limbs, and entire trees crack and fall to the ground. While nobody in the local community has been hurt by the falling trees, buildings and vehicles have been less fortunate. Cedar, Camp Wawona's summertime medical building, was grazed by one such falling tree. The building itself escaped with relatively minor damage, but the railing which lines the road passing in front of the longhouse wasn't so lucky. "The tree twisted as it fell" said Donnie Keele, "that is what saved the building from massive roof damage but the railing is a total loss." The cafeteria escaped untouched as a tree directly to the North chose to fall away from the building instead of falling backward and crushing the roof. Still, that tree took out camp's main power lines. The Redwoods, a local business that rents outs accommodations, lost a plow truck to a falling tree. Area roads were also effected by downed trees as all park roads were closed for two days. At Camp Wawona, four downed trees blocked passageway to to the top. Lacking a working chainsaw longer than 8 inches, CW staff were unable to clear the roads until a helpful neighbor lent two working chainsaws to the cause. NPS (National Park Service) also paid camp a visit to help clear the roads of downed trees and power lines. A mule that got parked in an unfortunate location shows the amount of snow which fell in one night. Cedar, Camp Wawona's summertime medical building is grazed by a falling tree. Looking at the still standing trunk of the fallen tree. Note the demolished railing. Because the tree twisted as it fell, Cedar escapes with minor damage. The Redwoods plow truck is totaled by a falling tree. A closer look at the totaled plow truck.